The classic, irresistible pickle. It has a home on the side of every plate of any good sandwich. It's comfortably familiar. It has a satisfying intensity of both flavour and texture. 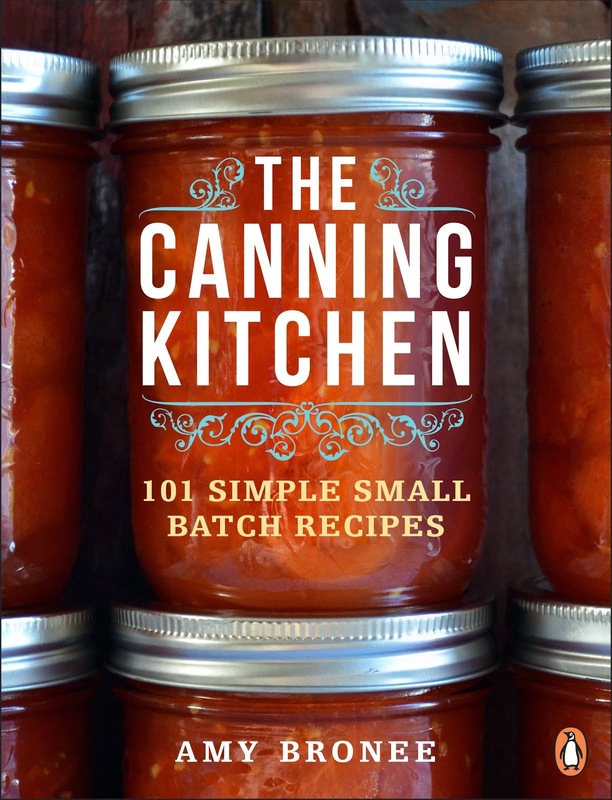 And it's a vintage home canning favourite. The perfect homemade pickle for me has plenty of garlic and plenty of dill, and I like to can them various ways - sliced for sandwiches and burgers, cut into spears lengthwise for the side of the sandwich plate, and whole for easy hand-held snacks when you just want to sneak one from the pickle jar in the fridge. It's all good. 1. 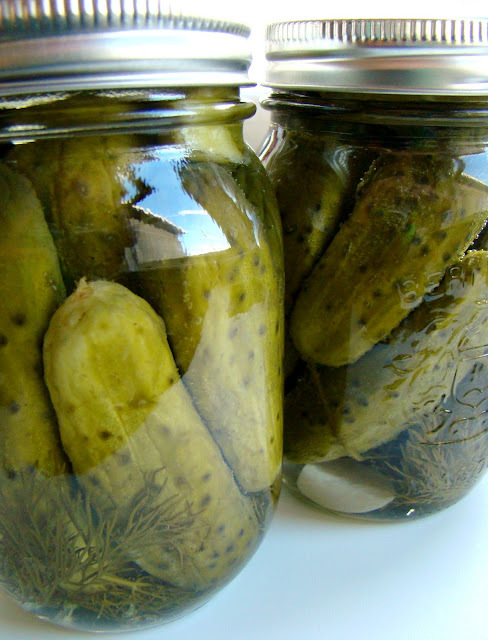 Try to make pickles as soon as possible after the cucumbers come off the plant or as soon as they're purchased. If you can't get to them right away, store them in the fridge to keep them as crisp as possible. 2. Don't skimp on the dill. 3. Two cloves of garlic is plenty. The longer you wait to eat your pickles, the stronger the flavour gets. 4. Garlic sometimes goes a bit blue when pickled. Don't panic. It's fine. 5. Weirdly shaped, gnarly pickles taste better than the straight ones. No, not really. I just think the ugly ones need love too. To prepare, wash your mason jars in hot soapy water, rinse them and leave to air dry. The sealing discs and ring bands should be left in hot water until ready to use. 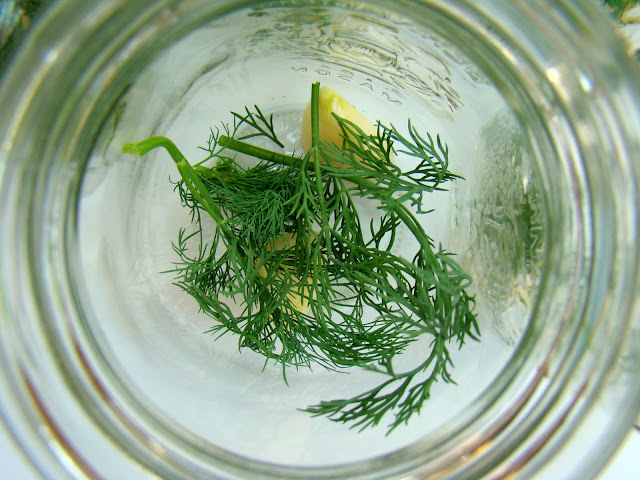 Drop 2 garlic cloves and a few dill fronds into each jar. Pack the jars snugly with the cucumbers, starting with the larger ones and filling in the gaps with the smaller ones (cucumbers shrink during processing, so pack tightly). In a medium saucepan, make the brine by bringing the water, pickling vinegar and salt to a boil. Ladle the brine into the jars leaving a 1/2-inch headspace. Secure the lids in place with the ring bands to fingertip tight, then lower the jars into the rack of an already-boiling water bath canning pot. Process for 10 minutes (only start timing when the boil returns). Remove the jars to a dish towel on the kitchen counter to cool for 12 to 24 hours and form their seal. Once fully cool, check for a good seal. Allow 3 to 4 weeks before opening for best flavour. It's so hard to wait to eat these! Every year I end up popping one jar open early to get that garlic dill crunch! I have NO patience when it comes to such yumminess. 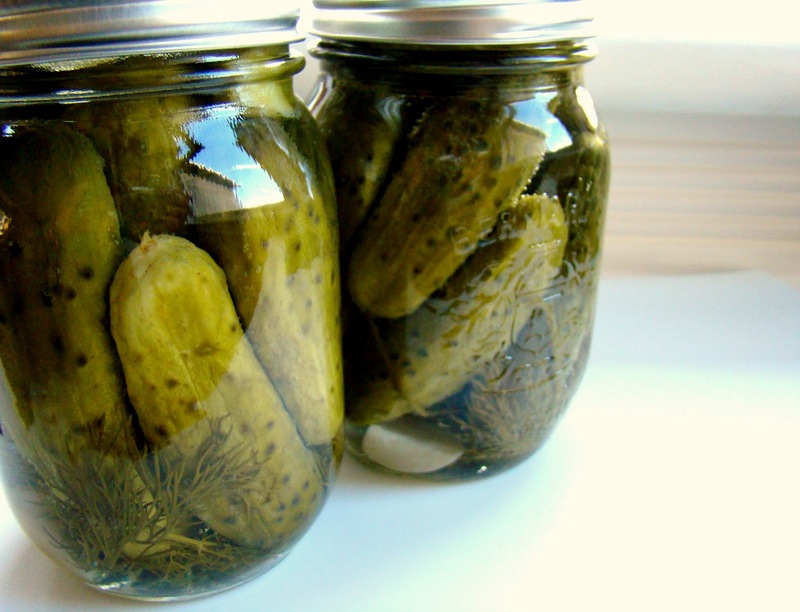 What's the best pickle you've ever eaten? 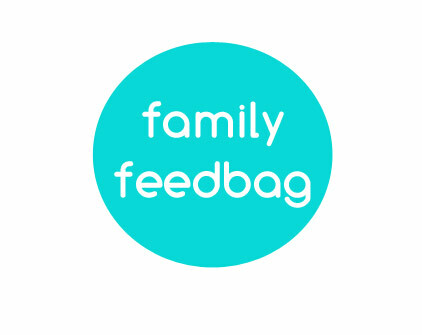 Is there a home pickler in your family? I love pickles and have always meant to make my own. My problem is that as a student I keep moving into progressively smaller spaces, limiting my pickle-storage space. I might just have to section of the last bit of room in my pantry for a pickle-fest. First time ever canning, and I made your pickles this year. We LOVE them. We made 10 pounds and played around with the spices (hot peppers, mustard seed, allspice, coriander, etc) in some of the jars. My boyfriend takes a pickle a day in his lunch (there is no way 10 pounds will last us through to next year), and they have been requested for gifts. I can't wait to use this recipe again next year, thanks Amy!!!! Can I use the metal lids for the pickles and if so how much room do I need to leave? Also, I am at 4000 ft elevation and they recommend 24 minutes in the boiling water bath. Do think this will make my pickles soft? 2-piece metal lids with a metal seal and a metal ring band are what's recommended. They're the standard lids that come with a case of mason jars. The ring bands can be reused, but the seals are a one-time use item. You need to leave a half inch of head space with these pickles. Regarding the processing time, I'm going to refer you to these high-altitude pickling recipes from the Colorado State University Extension Office: http://www.ext.colostate.edu/pubs/foodnut/09304.html If you use smaller jars, such as pint jars instead of quarts, you can process using shorter times as the temperature in the middle of the jar will be hot enough sooner. I started canning a few years ago and was having trouble getting my dill pickles to be crunchy. They always end up half cooked and soggy. Then a little old bitty (likely 80 years old) shared with me that you should put a 1/8 tsp alum into each of your jars, and instead of a water bath, put them into the oven at 200 degrees for ONE HOUR ONLY! Using the same 2 part metal lid system. Works like a charm!!!! Super crunchy dills. Thought I would share my find because it took me FOREVER to find this method!! I'm still trying to perfect the taste of my dills though and am going to try your recipe! I want them to be crispy and really sharp tasting :) Thanks for the post, love your blog! Hi Shelley - Those "little old bitties" have some of the best kitchen tips! To avoid soggy, soft pickles, I can them as soon as possible after coming off the plant. At my garden, I pick 'em right before I can 'em. When I buy a case of cucumbers, I ask when they were picked and choose ones that are firm and not bendy or rubbery, then pickle them right away. Also, I make sure my brine is hot hot hot when it goes in the jars so that the boil on my canner doesn't come down when I add the jars. Nothing leads to soggy pickles more easily than over processing. I hope you enjoy this recipe! It's so, so simple. 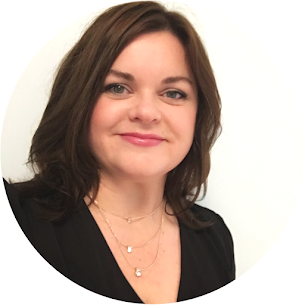 Hi Susan - Great question! Yes, there is a difference. Pickling vinegar is 7% acetic acid, while distilled white vinegar is typically 5% acetic acid. Read the label as vinegar almost always lists the percentage, and never use a vinegar with less than 5% acetic acid, such as rice vinegar, when canning to maintain safe acid levels. ALSO I FOUND OUT THRU EMAILING THE BALL JAR COMPANY THAT YOU CANNOT SUCCESSFULLY MAKE PICKLES FROM BURPLESS CUCUMBERS....22 JARS LATER I FOUND THIS OUT...THEY ALL UNSEALED. I LOST THEM ALL NOT KNOWING THEY WOULD DO THIS. I ALSO CONTACTED MRS WAGES..THE PICKLE PACKAGE THAT YOU BUY TO FIX PICKLES...AND THEY APPOLOGIZED BUT I STILL HAD NO HOMEMADE PICKLES LAST YEAR...I HAD NO IDEA THAT THE TYPE OF CUCUMBER MADE A DIFFERENCE!!!!!!!!!!! I recently read that you should always cut the blossom end of the cucumber off as there is an enzyme in it that causes your pickles to be soft and not crunchy. I don't know if there is anything to this, but thought I would share. Is it okay to use coarse kosher salt instead of regular coarse salt? Thank you! Yes, indeed! Kosher is the best alternative if you can't find pickling. Just don't use regular table salt as it can cloud your brine. Great question! Do you need to process the jars longer if you use larger ones than 500 ml? You would need a longer process, but I don't have the research-based processing times handy on that. 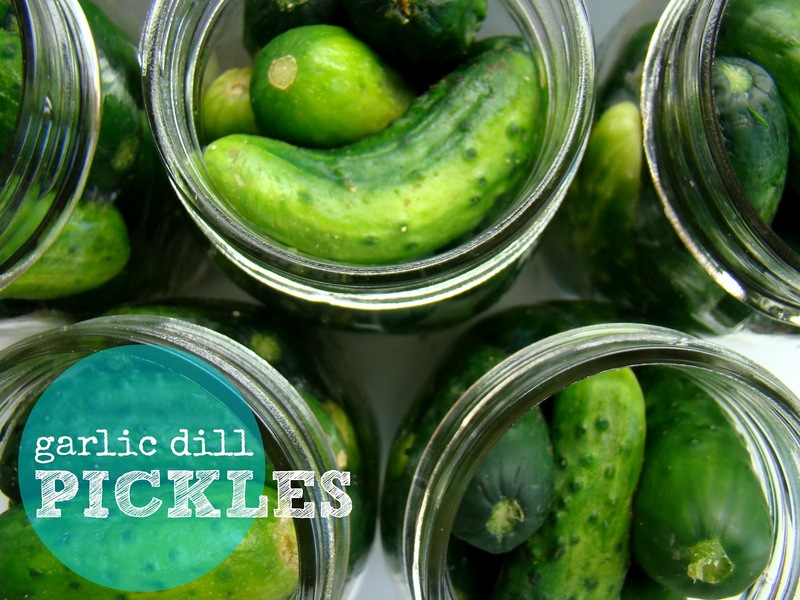 You might find processing times for larger jars of dill pickles from The National Center for Home Food Preservation online. I like to do mine in 500 mL (2 cup) jars, otherwise the longer processing could over-soften the cucumbers nearest the outside of the jar. Hope that helps!